Merops carunculata Shaw, 1790, Port Jackson, New South Wales, Australia. 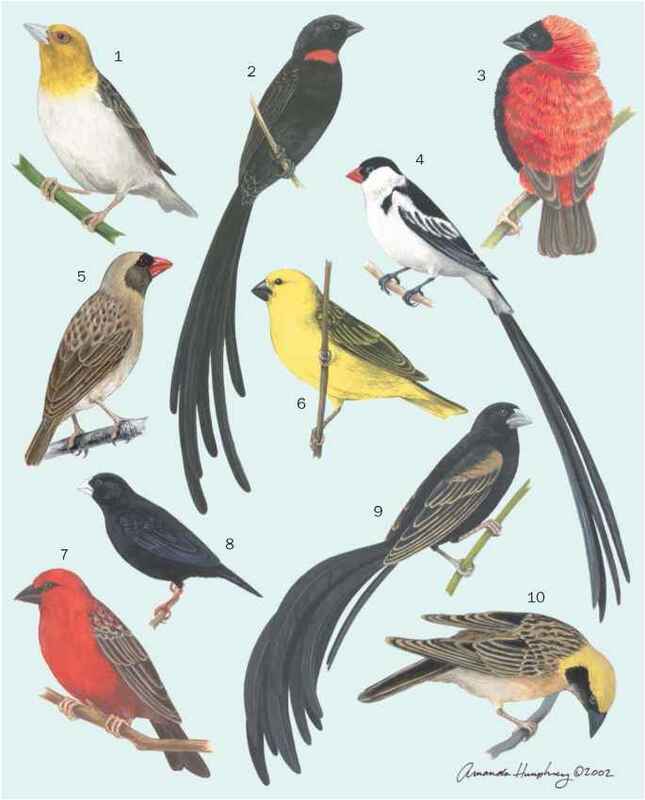 English: Wattled honeyeater, gillbird; French: Meliphage barbe-rouge; German: Rotlappen-Honigfresser; Spanish: Filemon Rojo. 14 in (35 cm); 4 oz (120 g). Female noticeably smaller than male. Buff underparts with white streaks and yellowish patch on belly. Upper feathers darker and white-tipped. White patch under eye with thin red band across chin. Southern Australia, with possible gap across Nullarbor Plain; separate subspecies in southwest and Mount Lofty Ranges of South Australia, Kangaroo Island, and eastern Australia. Vagrant to New Zealand. Woodland and open forest, typically with eucalyptus, mallee, heathland, parks, and gardens. Occur in pairs and family groups and sometimes loose flocks. Can be noisy and aggressive but are quiet while breeding. Male makes a harsh, raucous cough, to which female replies with a more musical plew...plew...plew call. Make other harsh rasping calls when nest or young threatened. Short distance migrant and nomad. Take nectar from flowers, especially eucalyptus, but also mistletoes and a wide variety of shrubs. Also eat insects from foliage, bark, or the ground and by aerial capture. Eat fruit less commonly, and rarely take small reptiles and young birds. Long breeding season, mostly August to December. Lay two eggs in a stick nest in a tree. Both adults feed young, which hatch at about 16 days and fledge after a further 16 days. Parasitized by pallid cuckoo (Cuculus pallidus).